Save 20% On Your First Order Today! Check us out today for only $7.99 we will ship you 1 - 8 oz. Jelly Jar soy candle. Check out our Satisfaction Guarantee! I love these candles, and would recommend them to anyone/everyone!! They are very fragrant and they burn very well. Never any waste of leftover candle wax on the sides of the jar. The Best Candles Ever!! 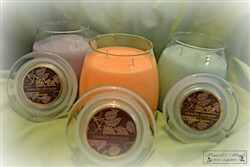 Wonderful candles! Great customer service with super fast shipping!! I won't buy any other candles because these are the BEST!! No one beats the price, the lasting fragrance, and the incredibly fast shipping!